Rob was Fabulous! He was knowledgeable and fun - took us absolutely EVERYWHERE!! One of the most comfortable rides we've had in a while! Got to see everything we had hoped for in style! TOUR GUIDE RESPONSE: Aloha, thank you Kristin! We had a fabulous day with Rob's guidance. He was very knowledgeable and showed us some fascinating part of Big Island. I will treasure the moment as we walked on brand new black sand beach. Also, There are so many great pictures to keep us great memory. TOUR GUIDE RESPONSE: It was a pleasure showing you the 2018 Eruption site and the Volcano. TOUR GUIDE RESPONSE: Mahalo Grace hope you liked the Pictures, loved the Hula pics. Come back and see us on the Big Island soon. Our family of six thoroughly enjoyed our volcano tour with Rob Kitsell. He was both personable and very knowledgeable about all that we were able to see. He made this a personalized tour and was very accommodating with what we wanted to do, offering us several choices once we'd completed the volcano tour. My teenage daughter particularly enjoyed seeing sea turtles! Rob also took many great photos of our day, which he promptly shared with us. Definitely recommend both the tour, and Rob as your guide! Fantastic tour with Rob who put together an amazing series of sites to feed my love of lava! He was incredibly informative throughout and I can not wait to come back to the Big Island and book another tour with him. He knew exactly where to take me on the perfect day exploring this incredible island. TOUR GUIDE RESPONSE: You are most welcome. Nice to have Informed excited clients. Come back soon. Stay in touch will let you know when some Lava surfaces. Rob was a great guide. Due to the government shut down just 2 days before rob had to come up with an alternative tour. The " new tour" was excellent. He took us to parts of the island that had been affected by the huge eruption just 6 months ago. The roads had only been open to the public just 10 days prior. So we got to actually visit a site with fissures and still smoking holes in the ground! We got much closer than I'm sure we would have had we gone to volcano national park! He had great videos too! We were on the Norwegian cruise and it was out first trip to Hawaii. We had 5 people including my wife, my 2 kids (17, 19) and my mom. Rob picked us up in his Mercedes van that had plenty of room. He met us as we got off the boat. Not only did he have a great itinerary planned, but he also allowed us to customize as we asked. He was extremely knowledgeable about the volcanoes and their recent activities - it was fascinating. He took photos and then sent us a link to all the pictures he took. Rob K provided an excellent 7-hour tour of the Kilauea volcano complex in his Mercedes van for 5 Alaskan adults. We drove all over Puna and Crater Drive, saw vast lava flows, old and new, with several stops to examine them. Of course, the visitor center and lodge, and the orchid garden as a bonus. Rob is extremely knowledgable about volcanics and was very much present during the 2018 eruptions. He is a fountain of information about history, culture, and life on the islands. Thanks, Rob! TOUR GUIDE RESPONSE: Thank you David, it was my pleasure! Have a safe flight home today, hope you saw turtles today before your flight! Rob was very knowledable and very accommodating. We had seen some of the places before on previous visits but it was nice to see them again. Rob took us to the Tex Drive In so we could try Malasadas Donuts which we had never tried before. The transportation was very good since we were a large group. I would recommend this tour. TOUR GUIDE RESPONSE: Mahalo Joe pleasure to show you and the group the Big Island. Great tour with Rob. He was extremely knowledgeable and made the trip both informative and entertaining. Due to a storm in the area, our cruise itinerary was altered and we wouldn't be in Kona until 2 days later. We were worried we might not be able to do the tour but Rob re-scheduled it for us with no issue. Would highly recommend! Punctual, went the extra mile by stopping at the hotel to let us dump our shopping before driving us to our lunch venue. Not a clock watcher and made sure we got to see all that we wanted to see. TOUR GUIDE RESPONSE: Aloha, in all my years of doing this, this is my first 4 star review. It surprises me I would only get 4 stars when I took you all to so many extra places and gave you so much extra time. I even took you to my local connection for affordable Kona coffee. Due to the recent volcano eruptions, Rob recommended that we take the Unvalcano tour which turned out to be a great mix of just about everything there was to see and do while in Hilo. Rob is a great guide and extremely knowledgeable. First class accommodations and willing to adjust and customize the tour based on what we wanted to accomplish. I would highly recommend him. TOUR GUIDE RESPONSE: Mahalo Adam great showing you and the family the Big island. Rob's knowledge of the Big Island was very impressive. He fulfilled all of our request and then some. He knows unique and out of the way destinations. We would highly recommend him. He also returned us on time to board our cruise ship. Rob picked us up at our cruise ship on time. He stopped at off the beaten path food havens. Went out of his way to avoid rainy weather and the other tour buses. He provide snacks and beverages. His knowledge of the history, land, people was informative. He went out of his way to make a memorable day. Rob was an excellent tour guide. He picked us up at our VRBO and was on time. He brought snacks and waters which was nice! He was knowledgeable and we felt that it was the perfect way to spend our first day in the Kona area. He even changed up the plans at the end of the day, and dropped us off at Kona Brewery! I highly recommend Rob! Rob did a great job showing us around Kona. He was very knowledgeable about the area and was accommodating to our requests. He was also quick to respond to any questions and adjustments to the tour that we had to make due to changes in our cruise itinerary. TOUR GUIDE RESPONSE: Mahalo Brenda. I was so glad you did get to see the Big island. We had a great tour with Rob down the West Coast to South Point. Special appearance by the Wild Man who jumped in the blow hole was an added treat. Much thanks to Scott and Rob for rearranging our trip, which was originally supposed to be a Hilo/volcano tour, but Kilauea had other plans. We had fun anyway! TOUR GUIDE RESPONSE: Mahalo Curt We hope you can return when Pele is behaving and Scott can show you the Volcano. WOW! Fabulous! Rob is an 11 out of 10! A wealth of knowledge, personable, enthusiastic, fun & professional - the PERFECT guide! You'll want to spend the day with him as he puts his heart & soul into his tour. Rob fit in everything he promised and MORE to please everyone, fast paced and full of variety & interest! All 10 of us, a group formed on Cruise Critic -LOVED Rob and his tour! Highly recommend you choose Rob from this husband and wife team, as we also had his wife Jodi the next day in another port. My husband, 10-year-old son and I booked with Rob for a sunrise tour of Volcano and Kona Coast in April 2018. Rob was prompt in his arrival to our hotel, informative in his explaination and history of events and very open to ultering our agenda. We tend to prefer off-the-beaten track areas and had already driven the island on our own. He was able to take us to areas we had not already explored. It was a wonderful days' journey. TOUR GUIDE RESPONSE: Thank you for taking the time to do review! You were some of the last people I took to Halemaumau crater that were able to see the glow from the lava! Sadly there is no lava anywhere on the island at the moment and Halemaumau has been changed forever by the 2018 eruption. Mahalo and a hui hou! We could not have been more pleased with rob as our tour guide. He was willing to customize our tour as we requested and offered wonderful advice. He picked us up on time at our hotel in a beautiful clean van and provided water and snacks as well. He is very knowledgeable about the history and culture and geography. He was professional and courteous. We invited him to join us for lunch and dinner but he just hung around close by instead. He took photos of us and later provided a link to them. My family of 9 celebrated Mothers 85 Birthday and Rob gave us a wonderful tour. He planned the tour keeping the weather patterns in mind and planned the tour route to ensure we pretty much had sunshine during the entire tour. He is well experienced and knew all the tricks of the trade. He even provide family group pictures at all the major sites. Overall great value. TOUR GUIDE RESPONSE: Aloha Larry hope the Vikings win for you guys today. Rob was great, not only was he amazingly knowledgeable about our tour, but he gave us a lot of other tips and insight to places we had already seen. We never knew how little we really knew about volcanoes! Rob was a great guide and really helped us understand what happened in the past and what is happening now with the volcanoes in Hawaii. In addition, he is so much fun to tour with! We would highly recommend Rob and this tour! TOUR GUIDE RESPONSE: Mahalo Barbara hope you liked some of the Pictures. Rob was an amazing tour guide! He was very fun, knowledgeable and flexible with our group of 8! We had a fantastic time and would highly recommend this tour. We had used Rob the day before to tour Hilo, so we knew we'd have another great experience seeing Kailua-Kona. One thing I failed to mention on the review of our other tour was that Rob was actively taking pictures of our group (and the surrounding beautiful scenery) to share with us later. That was an added bonus, since there were times we forgot to catch a certain picture. Rob is a professional who clearly enjoys his work and showing the beauty of the Big Island! Rob met us as predetermined and we began our tour. He was very helpful in answering any questions we had. What we particularly enjoyed was going places that the bigger tour buses would not have been able to navigate. There was a nice flow of conversation, but never to the point that we were tired of hearing about the region. Would definitely recommend Rob to anyone needing assistance in seeing Hilo. We also appreciated the free water and snacks he provided since the weather was warmer than usual. TOUR GUIDE RESPONSE: Mahalo Barbara a pleasure showing you the Big island. We all had a fantastic time and have lots of wonderful memories from all our trips. Thank you for organising so well our transfers and trips. Mr. Rob Kitsell was good driver , excellent guide, flexible organiser and a very kind and good companion. Thank again for helping us with the group photo. Rob was fantastic. 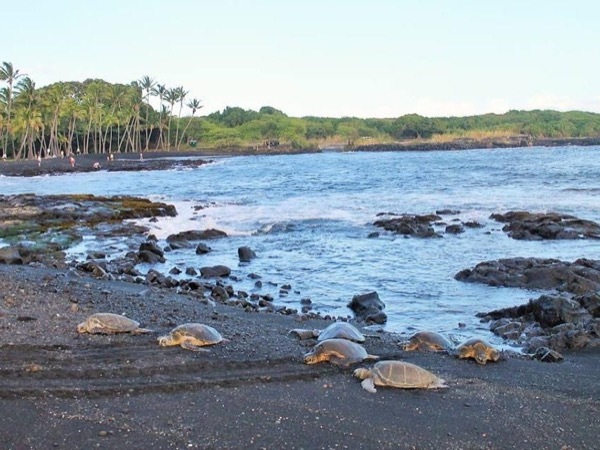 A must do tour on the big island!!! TOUR GUIDE RESPONSE: Mahalo Gary look forward to seeing you all on the BIG ISLAND again soon. Rob was an excellent guide! With the substantial amount of driving for this tour, Rob did a great job of breaking it up and providing interesting facts / trivia about our destinations. Really appreciated that he was able to suggest some location options to give us a more personalized experience. (Even tracked weather and worked with us to change the date to ensure we'd have a great time!). Overall excellent tour and loved the pictures he took. Would definitely recommend and would book again with him. TOUR GUIDE RESPONSE: Mahalo Joseph glad we avoided the storm. Enjoy Kanichi Pacific. Rob gave us a fabulous tour for a group of 9 ranging in age from 6-63. We booked him for Kona and Hilo. He was able to maximize our time even working around separate reservations we had for helicopter tours. The bus he has is spacious and in excellent condition. I love the fact that he had refreshments and chips for the kids. A plus for me was taking us to the store for additional local brews. On top of this he is great with the camera. I would not hesitate to recommend. A big thank you to Rob, "Uncle Al" & the Wildman Lonnie & crew for taking such good care of us. We (8) went and the South Point tour and it was everything and more. On our way down we stopped at the Painted Church ⛪ and got some interesting bits of history. Then we arrived at South Point and hopped into Uncle Al's car to head to the green sand beach. Our off roading was so much fun!!! We walked, hiked and swam. The waves were big and it was just what we needed in order to come back hungry. TOUR GUIDE RESPONSE: Glad you all enjoyed it. Southpoint and the Green Sand Beach has always been a place I have enjoyed taking people. As It is such a remote location. I teamed up with the Wildman and Uncle Al and it makes it a fun day out. I wish more people would take the tour because it is tremendous fun and helps local people. Mahalo Rob We have great pics of you guys jumping off the cliff. Absolutely the best tour (of 4 TBL tours) we had. Rob went the extra mile in every way and our tour went into some serious overtime which we greatly appreciated. Highly recommended. TOUR GUIDE RESPONSE: Mahalo we look forward to see you back on the Big Island soon. Rob was prompt, professional, and knowledgeable. He provided a custom tour in his very nice van. He went over and above any of our expectations. TOUR GUIDE RESPONSE: Mahalo Carol We look forward to seeing you and you're clients back on the Big Island soon. Amazing tour! Thank You So Much!! A fabulous tour that was suited to all ages. Very experienced guide who provided beyond excellent service! What a great tour! so much better that any of us imagined. Rob was prompt, interesting and a wonderful host! Would book him again! Great guide. Really helpful for my husband when the hiking got to be too much for him. Got me as close to the lava as possible. Highly recommended. TOUR GUIDE RESPONSE: Mahalo Ellen Lava has been on and off all Summer To view pictures bigislandvip.smugmug. com I was thinking over my Florida customers last week. I hope all is well with your Florida home. I know you both have a DC residence as well.. This was our second day with Rob ~~ we toured with him on Hilo side also. We were very pleased with his service and by the time the 2 days of tour were over, we felt like we had spent the time with a good friend. Rob was very personable and very knowledgeable about the island. He was totally adaptable to what we wanted to see and made good use of the time we had. We really enjoyed our time with him and would definitely book with him again in the future !! TOUR GUIDE RESPONSE: Look forward to seeing you all again soon lets try for next years Merry Monarch. Rob was with us at Kailua-Kona and was very professional. We had a great time during the day we spent with him. We highly recommend him as a tour guide if you're visiting Kailua-Kona. Rob was an excellent tour guide! He was very knowledgeable and interesting. He customized the tour to our wants. He even had rain gear and water for our hike. Could not have been happier!!! Loved my tour. TOUR GUIDE RESPONSE: Mahalo Michelle. I am sorry after the long Hike we could not find any glowing Lava. Hope you got to see some down the cliff from the ship. Great guide, has a lot of knowledge, we learned a lot in this tour, A+ for the tour and A+ for the guide. TOUR GUIDE RESPONSE: Mahalo Vicente a Pleasure showing you the Big Island. Hope we see you all again soon. We had a great time with Rob K. He is intelligent, intuitive and a great conversationalist. TOUR GUIDE RESPONSE: Mahalo Bob. Rob did a excellent job on our private tour. Very knowledgeable also very good with surly teenager. Was very flexible to our needs/wants. Do not hesitate to take this tour with him. TOUR GUIDE RESPONSE: Thank you so much. Have you seen the pictures I love teh one of Jay helping his dad thru the Lava tube. Rob was an exceptional guide in every way. He cheerfully responded to all our specific interests. He didn't hesitate to add activities that some in our group wanted. We shopped, some of our group kayaked, we snorkeled with turtles, and that was in addition to all the activities listed in the tour. He went out of his way to be sure our day was everything that we wanted. An exceptional guide in every way. Rob was an outstanding guide and made our day unforgettable. He didn't hesitate to make adjustments to meet the needs of everyone in our group. We never felt rushed, we always felt he was there to be sure that we all were having an experience of a life time, which we did. This was our first tour with Tours By Locals and I am now sure that it won't be our last. Very flexible and accommodating to our desires and schedule. Rob help us fit about as much as possible into a day on the Hilo side. Very knowledgeable about Hawaii in general and all of the sights we visited. He took us to some out of the way places (hot pond) with mostly locals. Even had rain ponchos for the Lava Tube. Accommodated 9 of us including a 2 yr old and 86 yr old on same trip. Everyone had a GREAT time. What a exhilarating phenomenal tour this was!!! Our group ranged in age from 30 yrs. to a woman that was 82, we had a man who had COPD but EVERYONE had a exceptional time! We each did something different... from jumping off the sea cliff, kite fishing, or just sitting and drinking under the tent. Rob's geniality was the best of any tour guide we've ever come across. He emailed us and kept in constant contact through the whole process, it's the greatest distinction- number one reason I would recommend him. Great Tour Guide... personable, knowledgeable and friendly. Would highly recommend. Thanks Rob. the tour was beyond all expectations; handled thoroughly & professionally and just prior to returning to the cruiseship, he took us to a beach with friendly turtles that swam with our children. A perfect day as a result of Rob's personal attention to all details and he anticipated the interests of the three generations of our group, including grandparents, young adults and a 10 year old grandchild. His tour was the absolute highlight of our trip. Rob is as knowledgable as he is fantastic company. TOUR GUIDE RESPONSE: Kathleen Thank you so much for the review. It was a pleasure sharing the Big island with you guys. FYI the closure we bumped into on the tour was sadly a 3 car crash 2 person fatality. Excellent in every way. Rob was awesome. He catered to our every need and was as helpful as could be. I highly recommend him and will tell anyone we know to hire him if they ever get to Hawaii. TOUR GUIDE RESPONSE: Aloha Linda Thank you for the kind review Rob K.